A team of Researchers from the Universities of Bristol and Bedfordshire, in partnership with multinational company ABB, have developed and tested a series of plasmonic nanoantenna arrays that could lead to the creation of a new generation of ultrasensitive and economical fluorescence sensors that could be used to monitor the quality of water. The arrays, developed and tested by Dr Neciah Dorh during his PhD at the University of Bristol, are composed of aluminum nanorods fabricated using electron beam lithography by commercial partner Kelvin Nanotechnologies. The nanorods measuring 50 nm in width and 158 nm in length are designed to resonantly improve fluorescence emission from a variety of contaminants in water such as tryptophan or diesel. The research, published in Applied Optics, reveals a six-fold increase in measured fluorescence emission from a dye. The research also reveals that by appropriately designing the array element spacing, intensely directional fluorescent emission can be acquired which would allow for extremely integrated multi-wavelength sensors to be built. The research was conducted by Professor Martin Cryan's group, which is part of the Photonics Research group in the Department of Electrical and Electronic Engineering. The project was a partnership with Dr Andrei Sarua from the School of Physics at Bristol and Dr Tahmina Ajmal from the University of Bedfordshire, who had formerly worked on the Aquatest project at Bristol. Together they created a prototype economical, LED-based sensor system, which they plan to develop into a hand-held field deployable system for conducting water quality monitoring. 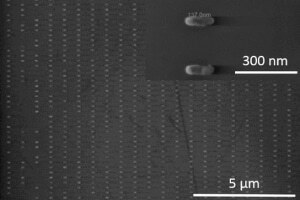 The nanoantenna arrays, which can be fabricated by lower cost production techniques such as nanoimprint lithography, can bring significant sensitivity enhancement so that laboratory quality measurements could be carried out in the field. This would allow for deployment of remote wireless sensor networks for early warning of pollution or continuous monitoring of water quality in sensitive environments. Dr Dorh, currently a Fellow within Bristol’s QTEC programme, has co-founded a start-up, FluoretiQ, designing quantum enhanced fluorescence sensors which will help identify bacteria in a matter of minutes rather than days. Professor Cryan's group is building systems that could integrate the power of nanoantennas with quantum enhanced sensors to create yet more sensitivity enhancements.